While overhead electrification using 25,000 volts AC is a widespread technology that is even found in several states in the Northeast, it has never been used in California and the relevant regulations either do not exist or do not allow for it. Caltrain finds itself in the unenviable position of blazing a new regulatory trail, with little success to show thus far. In 2007, Caltrain filed an application with the California Public Utilities Commission to have a new General Order established for 25 kV overhead railroad electrification. This application was backed by a draft standard and a series of workshops, and attracted participation from electric utilities and freight railroads. Caltrain later realized that the duration for establishing a new GO and only then applying under it for permission to build the project would not meet their schedule for completion by 2014. Despite an FRA reviewer stating that the draft standard was "96% of the way to the finish line," Caltrain withdrew its application, scrapped the draft GO, and decided instead to file for a waiver of existing rules on a project-specific basis. In June 2009, Caltrain filed a new application requesting authority for variances from portions of CPUC General Order 95, which governs overhead electric line construction in California. This application was shared among interested parties including the Union Pacific Railroad and its key customers on the peninsula. 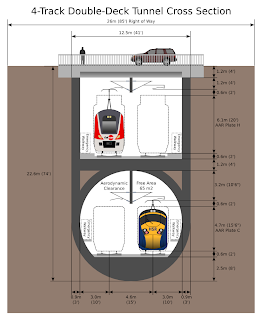 Caltrain's proposed variances do not meet industry engineering standards. Among other items, UPRR states: "The issue of clearances is critical. Clearances determine, in part, the types of railcars that can be operated on a track and the types of loads that a car may carry." Caltrain's proposed variances conflict with UPRR's legal rights and obligations as a common carrier freight railroad. UPRR contends that constraints on the types and loads of railcars would constitute a forced abandonment or partial abandonment of UPRR's peninsula operations, which requires approval from the federal Surface Transportation Board--and not the CPUC. Caltrain's proposed variance would conflict with the trackage rights agreement established when the peninsula corridor was sold, especially the clauses concerning abandonment of freight service. Caltrain has learned that certain interested parties had more serious concerns with the Application than were anticipated. Rather than undertake discussion with such parties under the scheduling constraints of a Commission proceeding, Caltrain prefers to resolve these concerns separately and resubmit the Application at a later date. What this reveals, if nothing else, is that UPRR will vigorously defend its rights on the peninsula corridor, even without prodding from local residents who oppose HSR. This does not bode well for other regulatory changes that will be required, in particular a waiver of GO-26D to allow level boarding at station platforms--another move that is sure to attract a protest from UPRR. The basic issue that underlies all this legal maneuvering is one of clearance dimensions, especially vertical clearances, where high-voltage overhead electrification infrastructure (contact wire, supports, etc.) might interfere with the operation of excess-height freight cars. UPRR and its customers (especially the Port of San Francisco) want the unimpeded future ability to operate so-called excess-height freight cars, such as autoracks and double-stack container cars, none of which currently operate on the peninsula north of Santa Clara. Such excess-height freight cars are up to 20'3" tall measured ATOR (above top of rail), with a recommended clearance of 23 ft ATOR for any obstacles such as bridges and tunnels. 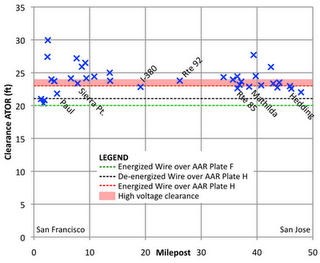 Caltrain's plans to electrify the peninsula showed the 25 kV contact wire at a typical vertical height of 23 ft (7.0 m) ATOR, in compliance with these recommendations. 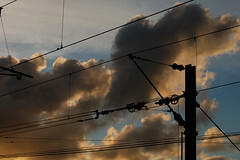 High-voltage wires require additional stand-off clearances (about 1 foot) to prevent arcing to trains or bridges, i.e. short circuits. The peninsula corridor has numerous bridges with clearances at or less than 23 ft ATOR (see graphic at right), where the overhead wire would get closer to the top of freight cars than the recommended clearance. Electrification support infrastructure underneath bridges can take up several feet vertical clearance, especially when configured for high speeds (125 mph) where a single trolley wire is insufficient. Increasing vertical clearances under existing bridges and tunnels by undercutting the rail bed is often complicated by utility lines, culverts or creeks that pass under the tracks. Clearly, excess-height freight cars will considerably complicate if not preclude electrification, and something will have to give. 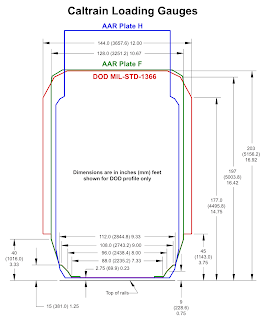 The simplest solution, one that is in the best interest of the people footing the electrification / HSR bill (yes, that's you), is for Caltrain to file an application with the STB for a partial abandonment of freight service, resulting in a permanent restriction to AAR Plate F clearances (freight cars 17 ft ATOR, with overhead wire at 20 ft as shown by the green dotted line in the graphic above). This would not impede any of the current freight operations on the peninsula, and would facilitate the construction of trenches for certain grade separations in sensitive residential areas. Ultimately, Caltrain's role in this situation is secondary. The players who hold the cards are the UPRR, the California High Speed Rail Authority, and the Federal Railroad Administration. It is unclear if these players have any interest in the simple solution. Will they think about who should pay for this? Freight is and always will be a minority rail user on the peninsula, and it's hard to think of a reason why taxpayers should spend millions of dollars to buy UPRR and its customers complicated and maintenance-intensive solutions like movable overhead conductor rails or gauntlet tracks, especially when excess-height freight cars already have ample access to key regional facilities like the Port of Oakland. We've already seen what gold plating for freight can do: expensive infrastructure is built on the taxpayer's dime for some hypothetical future need, and then languishes unused. Exhibit A is the Kelly Moore freight spur in San Carlos, which has yet to see its first freight car. Despite some earlier skepticism that the Context Sensitive Solutions process would be embraced in upgrading the peninsula corridor for high-speed rail, program officials now say they're signed up to it. 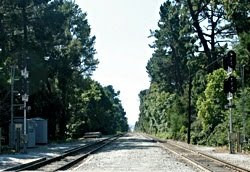 This development was successfully precipitated by the Peninsula Cities Consortium (representing several peninsula cities in matters pertaining to the project) and Californians Advocating Responsible Railroad Design, (CARRD) a group of mid-peninsula residents concerned about project impacts. Context Sensitive Solutions: An Overview by Hal Kassoff, Sr. Vice President, Parsons Brinckerhoff, Washington, D.C. Context Sensitive Solutions for the Peninsula: Community Engagement and Project Design by Bruce A. Fukuji, Peninsula Rail Program. For everyone who wants this project "done right," CSS presents a structured opportunity to build consensus about just what exactly "right" means. The commitment to use CSS is not a small one, considering that specific peninsula design alternatives are already being debated behind closed doors, and that the final project EIR/EIS is still planned for end 2011. Playing out against a backdrop that includes the program EIR being decertified by the Atherton lawsuit, rail officials now seem to realize that the path of least resistance may lead through CSS. 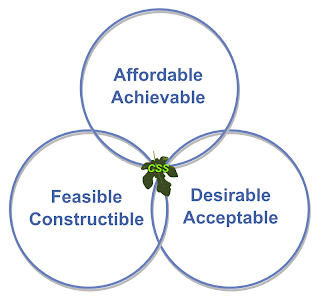 Failing to achieve a reasonable level of community consensus is likely to mire the project in CEQA lawsuits for a long time. That's not stopping the local press from dismissing CSS as a gimmick.